The Miami Heat won its 18th straight game last night, routing the Indiana Pacers, 105-91. Among all-time win streaks, Miami now ties for the seventh-longest in NBA history and eclipses a 17-game run by the Los Angeles Clippers earlier this season. The second-longest all-time NBA win streak, 22 games by the 2007-08 Houston Rockets, is certainly within reach, whereas it will take something extra special for the Heat to approach the 1971-72 Los Angeles Lakers' NBA record 33-game winning streak. 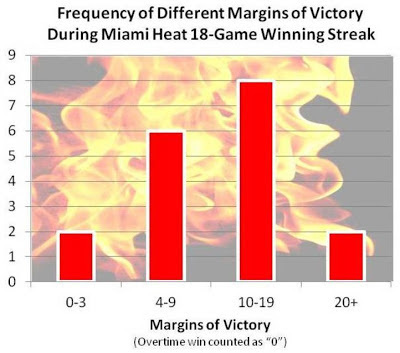 Though a comparison to the Lakers' record is admittedly premature, I find it instructive to compare their margins of victories during the 1971-72 streak to Miami's during its current run. 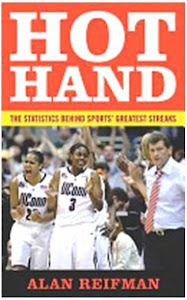 By routing opponents, a team can rest its star players, keeping them fresh for the long grind of a streak. As I documented in this retrospective on the Lakers' streak, they won 23 of the 33 games (70%) by double-digits. 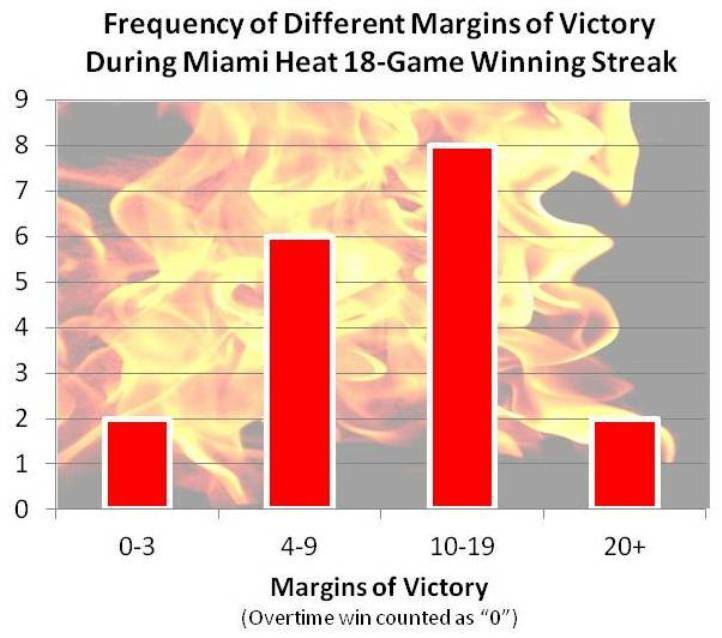 As shown in the following little chart that I made, the Heat has won 10 of the 18 games in its streak by double-digits (56%). As a further sign of how little the 1971-72 Lakers were challenged during their streak, they won 32 of the 33 games in the streak by four points or more in regulation; the one exception was an overtime game. Miami has had two close calls: a one-point win over Orlando (97-96) on March 6 when LeBron James made a layup in the final seconds and a Feb. 26 double-overtime game against Sacramento, which the Heat ultimately won handily, 141-129 (Heat game-by-game log). A sweep of these five games would give the Heat 23 straight wins and the second-longest win streak in NBA history. Although none of the NBA's elite teams of the current season (e.g., Oklahoma City, San Antonio) appear during this upcoming stretch, there are three reasons for Miami fans to be concerned: five games in seven days make for a tiring stretch, four of the games are on the road, and the Heat and Celtics have an intense rivalry, going back to last season's seven-game conference finals, so you know Boston will be ready a week from today!